We decorated our tree on Friday. I love unpacking the decorations and remembering when each handmade one was made (they aren't all handmade). 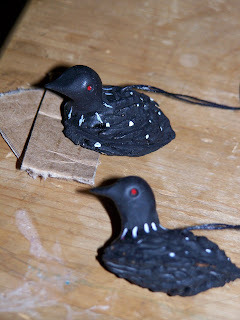 These ones I made many years ago when my 12 year old was only one year old. Can you tell what they are made of? Peach pits, with a little bit of black Sculpey for heads. I have always loved loons ( who can resist their calls?) 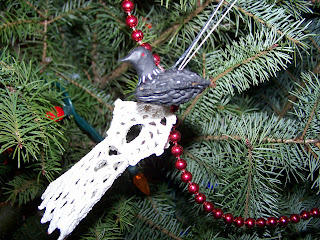 and so when I saw these ( I think it was in a Canadian Living magazine) I really wanted to make them. 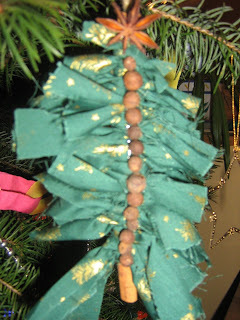 The boys also love making tree decorations, and here is one that W made out of a cinnamon stick , fabric strips, whole allspice and a star anise. 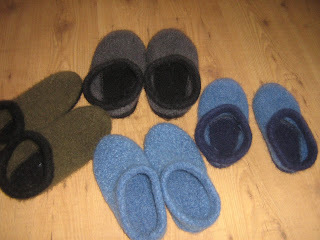 *A slipper update - four pair knitted and felted, one pair needing one last sole which will be done today - it will, it really will. Oh, oops! Forgot to ask for pattern information for these slippers. 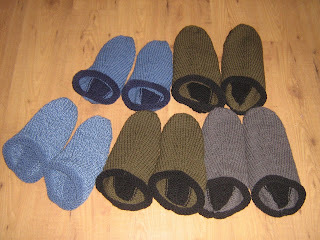 I have admired them long enough, I think I should try making a pair! It is Fiber Trends pattern AC-33x Felted Clogs. I love it. It was purchased at a local yarn store but you can also buy it online. If you google it you should be able to find a local source for it.